The many advantages of bicycling for recreation and as a mode of transport have become hot topics for Princeton residents in recent years with active members of groups such as Princeton Future, Walkable Princeton, and the Princeton Bicycle and Pedestrian Advisory Committee promoting improvements such as dedicated bicycle lanes. Recently recognized by the League of American Bicyclists as a bicycle friendly community, Princeton has long had bicycling enthusiasts. In the 1970s, landscape architect Henry Arnold was foremost among them, earning the moniker “Mr. Bike” for his advocacy of two wheels over four. 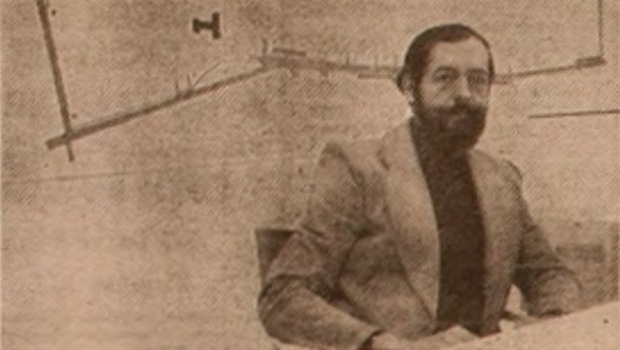 In this photograph from a spring 1973 issue of Town Topics, Arnold sits before a map of proposed bike-paths for Princeton. In the article, he described ways in which automobiles damage the environment by reducing green space to islands with fewer plants and animals; through noise pollution; and by causing changes in the ground water during the construction of highways, which in turn generate the need for more highways. “By riding a bicycle, you take a dramatic individual stand against damaging the environment,” he said. Besides, riding a bike is fun, even in the rain. An ex-paratrooper, Arnold came to Princeton from Vermont where he worked on a master plan for the campus of the University of Vermont and on city parks in Singapore, Nigeria and Chicago. In Princeton, he founded his own landscape architecture firm in 1988, Arnold Associates, in partnership with Stephen Lederach. The firm focused on urban sites, with special expertise in developing and using new urban tree planting techniques, and continues to do so today under the leadership of Lederach. After earning his bachelor of landscape architecture degree from the University of Pennsylvania’s School of Fine Arts, Arnold studied forestry at Penn State. He practiced landscape architecture for nearly five decades, often lecturing on ways in which landscape architects increase the sustainability of urbanized areas by making cities more liveable. For his work, he received a number of honors and awards, including the designation “Distinguished Artist” by the New Jersey State Council on the Arts. In 1980, his book Trees in Urban Design, now in its second edition, won the American Publishers Award for best book in architecture and urban planning. Other accolades include design recognition and honorable mention in the Vietnam Veterans Memorial Competition (1981) and the Pershing Square Competition (1986). He is a Fellow of the American Society of Landscape Architects. Many of Arnold’s ideas have found a receptive audience in today’s Princeton, as Mayor Liz Lempert shows. Now retired and in his eighties, Princeton’s Mr. Bike now resides in Pennswood Village in Newtown, Pennsylvania, where he continues to bike and tout the benefits of his preferred mode of transport.